But for a period of time toward the latter years of Reconstruction, the Secret Service took on another kind of mission: infiltrating the Ku Klux Klan, the white supremacist hate group that was founded in the months following the end of the Civil War. The operation that sought to end the Klan's terror campaigns were spearheaded by a man named Hiram C. Whitley, the subject of Charles Lane's fascinating new book, Freedom's Detective. Whitley was perhaps the biggest thorn in the side of the early Klan, which likely came as a surprise to those who knew him in his early years. 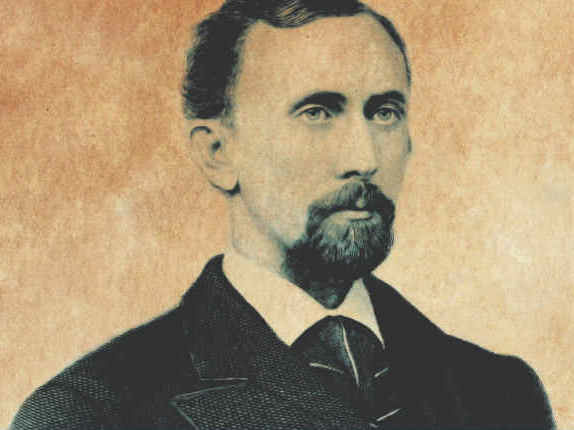 Born in 1832 in Maine, he started his career as a saloon owner with questionable business ethics; after being caught up in a scandal, he left New England for Lawrence, Kansas, in 1857. It was there that he was arrested for kidnapping after ambushing a convoy of white abolitionists and free black men, women and children on their way north, hoping to escape the "slave hunters" who had taken to terrorizing African Americans in the town. "Whitley's amoral attitude toward the great issues of slavery and equality, so evident in his slave-hunting in Kansas ... seemed to be evolving. The cruelty inflicted on enslaved people in Louisiana was so ugly that it could shock even his conscience, and, in one case, spur him to action." Whitley reinvented himself as a law enforcement expert, and it turned out he was good at it, thanks in no small part to his instinctive understanding of psychology — as Lane writes, "[H]e had developed a thoroughly jaded view of human nature, and how it could be manipulated to his advantage, honestly if possible — but through deception if necessary, and convenient." He eventually earned a spot as one of the Secret Service's first directors, tracking down counterfeiters using a mix of "deception, or force, [and] his own undeniable charm." Lane's account of Whitley's infiltration of the Klan is endlessly gripping, and he recounts it with an impressive narrative tension. He also does an excellent job placing the operation in historical context, chronicling the racism and resentment that built up in the South following the end of the Civil War. It can be difficult, though necessary, to read his descriptions of the Klan's reign of terror, but Lane is careful not to sensationalize the inhuman violence that was the group's stock-in-trade. He's also careful not to lionize Whitley, who was, to say the least, a flawed person. "He could be a con artist, and a bully," Lane writes, "and those aspects of his character had gotten him into one tight spot after another, then helped get him out." They would also bring about his downfall — Whitley's time in government was ended by a scandal so unnecessary and harebrained, it almost defies belief. The best history books are often the most unexpected ones, stories of relatively obscure people who changed society in some way, big or small. Whitley certainly isn't a household name, and never was, but his vision of the Secret Service as a national investigative force dedicated to rooting out a variety of crimes helped make the agency what it is today. Lane proves himself to be an excellent researcher and writer, and Freedom's Detective is a captivating account of a flawed but remarkable man.